It has been two months and the ship has now crossed much of the Southern and part of the Northern Atlantic. We were supposed to finish up our research and get off at the Azores but I am very happy to announce that we will continue the research all the way to Stavanger! 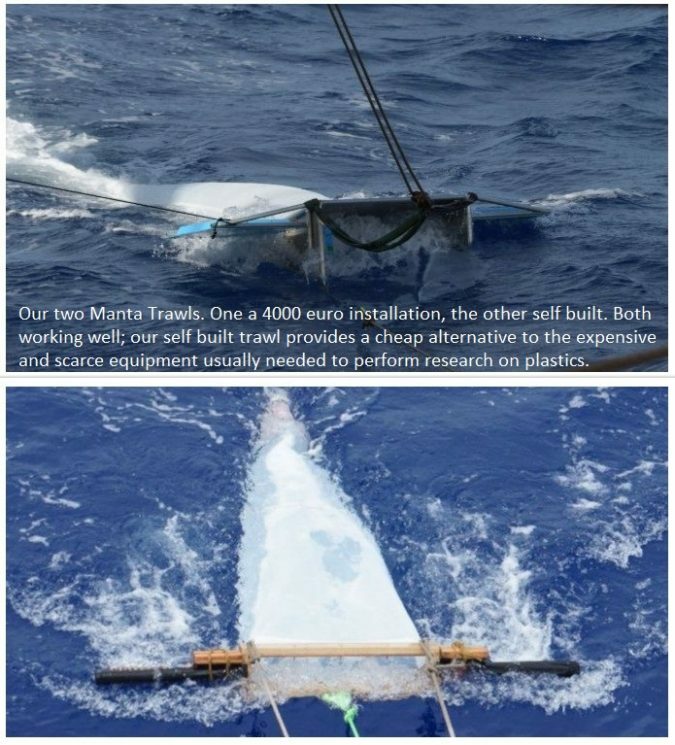 This means that we are able to take samples of the entire Atlantic ocean – all the way from the South to the North! Our last update was from when we were about to embark from Cape Town. Since then, we have trawled many times, with very different results in the different seas and currents we encountered. We found that the quantities of plastics present in the South Atlantic are few, but stable and were quite disconcerted to find so many plastics in all trawls even in one of the ‘cleanest’ oceans on earth. Sailing in the South Equatorial current we were able to gather enough to get a picture of the abundances in the area and saw a decreasing amount of plastics as we headed farther north, and out of the South Atlantic Gyre. We reached the Doldrums a few degrees north of the equator, where the weak winds gave us ample opportunities to sample. The Equatorial Counter Current was almost as empty of plastic as it was of wind. Our trawls from there turned up very few or no pieces of plastic. This current separates the North and South Atlantic Gyres, flowing against and between the North and South Equatorial currents. Plastic quickly reappeared as soon as we entered the North Equatorial Current, the southern limb of the North Atlantic Gyre. A single glance in the net was enough for us to realise we’d far exceeded the quantities of plastic from any previous trawl. With over 140 individual pieces we’d either entered a new area of the ocean or a particularly plastic-abundant gyre. The next day our sample contained over 300 individual pieces. With a third and fourth sample collecting double the amount of the day before, until we reached an astonishing number of 1500 pieces, we can comfortably state that the contrast in plastic quantity tells us without the aid of a chart that we have entered a new region of the ocean: the North Atlantic Gyre, with its debris coming from the European and American coast, and so an increase of marine industrial activity. It is in these oceans, that a ‘plastic soup’ of microplastics have been discovered by the Ocean Cleanup. It seemed we were going just through that; there were several clear days where you could just look into the water and see numerous small fragments floating by. Our plastic observation team was forced to make estimates, because it was impossible to keep count. These days were also the days that we saw a great many large objects floating by. Every time we looked out, there was an object to be found. We saw pieces of Styrofoam, fishing crates, a shoe even, buckets, jerrycans, nets… Much of it seemed to come from other (fishing/cargo) ships. The abundancy of plastics was also visible on the beaches of Horta (Azores), where a large amount of plastics is visible (even sometimes in the water, I just picked up a plastic bag while swimming) on the beaches. 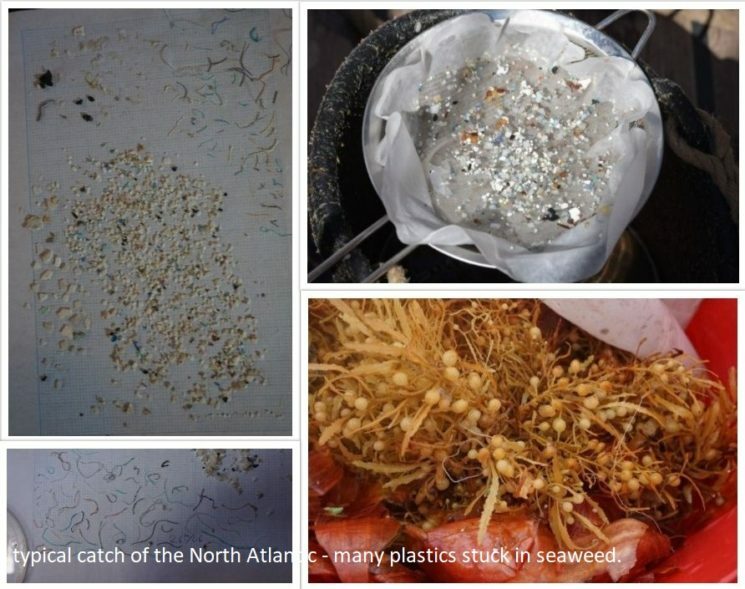 Although research shows that there is a lot of damage already done in the North Atlantic regarding plastic pollution, the reactions to our research and seeing that so many people were so supportive and motivated to contribute in their own way is extremely encouraging. We are delighted with the overall research results and most especially with all the involvement of everyone and are positive that together we can make a change! What will happen next is that we will take our samples to the lab for analysis – what types of plastics did we find? – and see if we can trace found plastics back to producing industries. This will provide the basis for greater research where we will look at how the producing side of society can contribute to limiting the amount of debris coming from their products. We believe that together with an increasing awareness on the consumer side, there is a need and a market for products that are produced and encouraged to be disposed responsibly and that a large part of the solution can be found there! For now, we thank you for your support and hope you will continue to help fight plastic pollution! If you are interested in more detailed updates of our project: please follow our facebook page https://www.facebook.com/PlasticResearchBarkEuropa/. We expect our first report about the results and analysis of our samples to be ready this fall and we will of course send this to you. Also, look out for our video, soon to be edited and published! You’ll hear from us again! Ps. Do you also want to do something for our oceans? A great way to contribute is by limiting the amount of single use plastics you buy, for example in food packaging, and by using re-useable containers made of long-life recyclable plastic and other materials. You can also help by spreading the word and share our page – Research for clean seas: Researching plastics in the Atlantic. Indicators for the prevention of microfibre shedding from apparel found through the Don’t Feed the Fish campaign. Microfibres released from clothes during both the manufacturing and the consumer wash and wear stages, have been found to have detrimental effects environmentally. Initially assumptions from the industry pointed at fleece fabrics as the main contributor, but driven to challenge this deeper within textile engineering, the campaign #DontFeedTheFish was launched in January 2017 to take research to the polymer, fibre and yarn level. Backed by the industry at the brand, non-profit and supplier levels, detailed research studied polyester yarns in lab conditions under various situations to assess breakage behaviour patterns. Work concluded that UV exposure and yarns of a smaller denier are both considerable factors in lowing tenacity in Polyester. The #DontFeedTheFish Campaign was launched, to raise awareness at the industry and consumer levels of this unseen, yet hugely impactful issue, whilst raising resources to conduct laboratory-based, controlled research. Industry-based support for this campaign was spearheaded by the European Outdoor Group (EOG) together with key brands including The North Face, Mammut and Finisterre who all recognised the need for a deeper textile engineering understanding of the issue. “Brands have a duty of care to make steps to ensure that the clothing we make is well designed and well made, and mindful of the impact of our sourcing decisions.” said Deborah Luffman, Product Director, Finisterre. The early support by brands to this work, raised a call to action to other industry brands and retailers in collective support of this challenge. “To solve a problem, you must first understand it,” said Peter Hollenstein, CR Manager, Mammut “The pioneering research performed in the #DontFeedTheFish campaign plays an important role in our industry’s collaborative endeavor to grasp the Microfibre issue in its full complexity and develop effective solutions. As industry interest grew, the work spun out into the Microfibres Consortium Leaders Group headed up by the EOG (http://www.europeanoutdoorgroup.com), of which biov8tion is a key research partner. Although the industry saw this initially as an issue associated with fibres pulling out of fabrics, #DontFeedTheFish highlighted this as a larger issue, associated also with fibre fragmentation generated by all fabrics of varying constructions, weights and compositions. With a hypothesis substantiated by desk-based research, the work set out to identify what triggers cause fibres to fragment, and how the varying textile production processes can be seen as opportunities to make change within textile engineering and processes longer term. The work focused on 100% polyester filament samples. The key learning from this entry level research found UV exposure to be a significant trigger on lowering tenacity in polyester. A lower tenacity of yarns at the garment level would mean that polyester fabrics are more prone to fibre fragmentation after UV exposure. Such an observation was consistent across the varying yarn specs tested, with up to 42% tenacity reductions after 72hrs UV exposure. A range of yarn sizes that varied from a 30 to a 150 denier were studied. Results were reviewed as tenacity in g/d and also as force in grams at break (which gives a more realistic representation of the yarn in use in a product). With the force-at-break approach, a consistent sliding scale was seen where the smaller sizes required lower force to break, and larger sizes a higher force to break. Many other observations were made in regard to recycled content, yarn brightness and supplier processes used, but were deemed inconclusive at this stage, due to relatively small low data sets gathered. Three subsequent pieces of work have since developed from this at both research and industry levels. The area of recycled vs virgin raw materials has been taken into a deeper piece of research in order to work towards concluding if virgin or recycled differ in regard to fibre release. A correlation of yarn results with corresponding fabric structures is being conducted in order to better understand the interconnection between yarn and fabric construction. Work carried out in collaboration with supply chain partners, has been kick-started to look at how these results can be used to support future product solutions at the yarn level. #DontFeedTheFish has successfully demonstrated a need to elevate research and development from the ground level (polymer) upwards to include fibres, yarns, and subsequent processing stages within the textile industry. 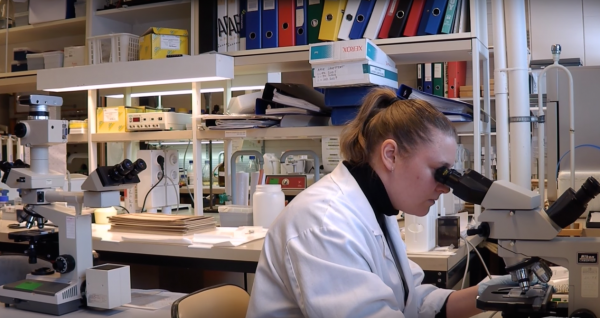 Eloise specialises in utilising immunohistochemical, genotyping techniques and statistics to identify associative risks for Alzheimer’s disease neuropathology from a large population-based brain cohort. Almost a year ago I released my crowdfunding campaign to collect funds to carry out my research into Alzheimer’s disease. 66 backers from 8 different countries supported me to continue my research for two months. That got me through some tough times last year, and I’m proud to say that I thoroughly enjoyed the experience. I am no longer wary about talking with everyday people regarding my research. What was especially encouraging was meeting some of my crowdfunders. I gave a seminar late last year, which was attended mostly by family members, and friends and family have inquired how much my research is progressing through normal discussions about daily life. Surprisingly, the majority of my backers did not want anything for their support, apart from the knowledge that they were helping me out. This was quite a shock to me, but has led me to believe I should make the effort to be open about what I do, because to the general public what I do might seem daunting. I had the very special experience in early Autumn last year to meet some of my crowdfunders in person, and show them around the laboratories. We sat down for almost 2 hours in total and enjoyed a discussion of my research, their queries about Alzheimer’s disease, and some common problems with research on Alzheimer’s disease. It was a pleasant meeting and I was humbled by their interest and encouragement, and at how my campaign had appealed to them. I also have a further one under review with my collaborators in Sweden. I was also requested to write a special piece for a Finnish journal, and currently my funding situation is comfortable until after the summer. I am waiting to hear back on my personal funding applications over the next couple of months, but it’s inspiring to know that I have my colleagues, collaborators, funders, friends, and family around to support me if things get bad again in the future. I have many new topics that have become interesting to me, and hopefully I will be able to get started on these and share some insight on them in the coming months as I take more confident steps into my career as an academic researcher. One of the topics is the (much neglected) connection between cardiovascular disease and Alzheimer’s and I will be continuing investigations into Herpes simplex as a pathogenic agent in AD. Once again, I would like to take this opportunity to thank all my crowdfunding supporters for their belief in my research, and me as a researcher. Could getting a cold sore increase risk of Alzheimer’s? Painful Science – getting published is tough! Should scientists learn to pitch? At the beginning of June 2016, I was selected as a finalist in a competition about innovation in scientific research communication. The reason for my nomination was specifically related to my crowdfunding campaign on Walacea and the supposedly novel way I communicated my Alzheimer’s research to the public. The campaign involved a short video which I did in the lab, some written text and offering a few perks to people who supported my work from seminars to a simple postcard. As a result of the campaign I found that people were actually quite curious about my work and interested in what I had to say about it. Before the campaign I’d assumed that talking about my research with any level of details was likely to be a conversation killer! The competition was a fun and enjoyable experience and the winner took home €3000 (which would have been nice). The run up culminated in an online voting system, which I’ll admit I wasn’t prepared for – it involved background work and lots of marketing to my network. As the only single individual of the 6 finalists (the rest were organisations or collective groups), I was largely doing it on my own which was tough, but I was proud of my efforts and really want to thank my friend Iita for nominating me, the organisers for selecting me, and of course everyone who has supported me throughout the whole (crowdfunding) ordeal! I came runner up out of the 6 finalists which is a a great achievement for me. This whole event and the social and research aspects of the concept of research communication were very new to me. I took on crowdfunding as a means to acquire financial support and continue the research I enjoy, and learnt the basics as I went. The further on in my campaign, the more I realised what was at stake, what was required and that more effort lead to more financial support. In addition good communication was vital! The campaign also gave me a broader view on things that go wrong in science and how engaging the public is a useful and important part of being a scientist. So, should scientists pitch for funding? During the Competition day, I took part in a workshop on the ABC in Pitching. In science, this is not a particularly strong point of interest. People give presentations on their work at conferences and seminars, and some also lecture to students or teach laboratory groups. They usually involve one topic and range in time from 20 minutes up to an hour or more. Plenty of time to get around to what you want to say, and also on the odd occasion to bore people’s pants off. Pitching is what I imagined entrepreneurs do to get funding to support their business idea and get it off the ground. Wait. Those essential elements are what we as scientists are trying to do. Once you get the ball rolling with support and publications, then things usually take on (to some degree) a life of their own. But in the beginning, you have to put in the hard work. I now realise more than ever that pitching should be an integral part of a scientist’s every day means. 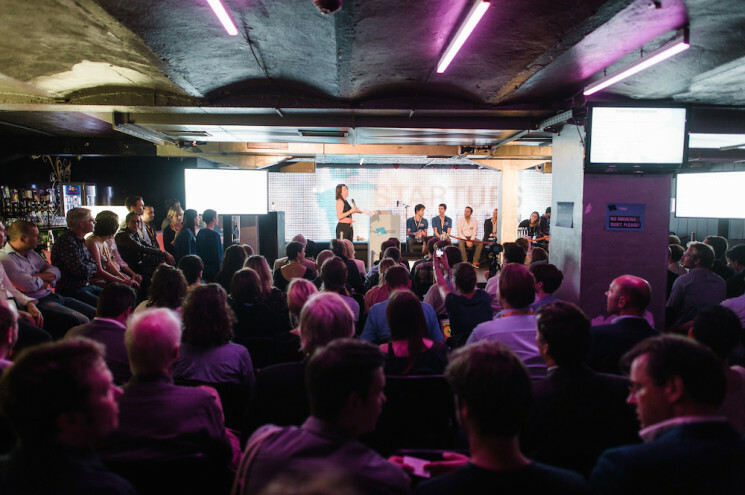 ‘Elevator pitches’ should be the correct way to grab the attention of funding agencies as well as members of the public through crowdfunding and make them interested enough to read on, ask questions and hopefully potentially fund you. Entrepreneurs would never send a full business plan to a potential investor from the gecko, they send pitch decks, executive summaries and arrange meetings and events…this system works for business so just maybe it could work for science and save everyone lots of time in terms of writing and reading grant proposals?! And infact, this is the system that crowdfunding is using where scientists can create a 5 minute video pitch about their work than a more detailed explanation of what they plan to do. It worked for my campaign and perhaps with even more pitch practice next time it could work out even better! Are women taking the helm in Science Communication? On a side note, at the competition one thing that struck me about the whole event was the gender difference. 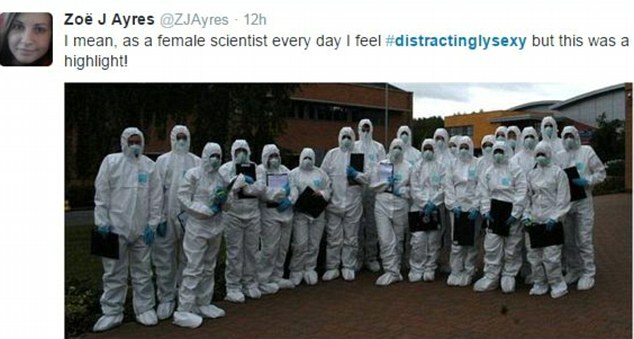 The majority of the people there either representing the finalists, or listening and at work promoting science, were female. There was a massive majority of women participants – almost to the realm of 90%! I wondered whether this was just a product of the fact this competition was held in Finland with primarily Finnish participants, or whether science communication is primarily undertaken by women throughout the world. A quick google of the topic seems to suggest that “women are more suited to communicating due to their natural style of communication,” thus indicating that perhaps it is not a phenomenon known only to Finland. In any case, I must admit that I myself have found a fair amount of satisfaction and pleasure in sharing my research and also my experiences through my crowdfunding campaign, radio, magazine, newspaper and tv interviews, as well as this blog, and the continual contact I keep with my supporters and followers. I hope that I continue to be as well received! Thanks for tuning in again! 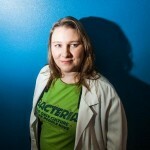 Can scientists be media personalities? In keeping with the idea that scientists can also be media personalities, I’ve just received an email to be interviewed for a women’s magazine here in Finland. Yes, it’s true. I’m not really sure of the positive fluffy role model image that I could provide, but they are interested in hearing about my crowdfunding adventure. As a colleague earlier said to me “It’s not bad if a scientist is in the news in a positive light”. Well….ok, I’ll go with it. But I should backtrack a little. I had my manuscript accepted for publication a while back and this week was the early view publication release. Now, that’s nothing to rejoice at in the world of science – although let’s be fair, I haven’t had an article published in four years, so I’m pretty ecstatic about the whole thing – but I believed the concept would appeal to the general population, so thought I’d jump on the bandwagon of press release accompanying research method. Well…it certainly has appealed to the public. An article on the University’s website (coupled with an English version – these guys are really getting to know me now! ), plus an article in the local paper. Not to sound too arrogant or anything, but that’s kinda THE DREAM….for a scientist. To get your research read by every day people thinking you’re on the way to a cure for such and such a disease. Because let’s be honest, as scientists we all believe our research is finding the ultimate answer to this or that. I do know however, how the media take your results and rewrite them the way that makes it seem like you HAVE found the cure. Boy have they done that. How many times do we have to read about the next ‘cure for cancer’ or something? Well that’s kind of what they did with my research. But I’m still excited about it, and if you’re interested in actually hearing more about it from my perspective rather than the media’s, I’ll attempt to explain the research itself and the implications. I was given an older autopsy series to work with on this topic, (compared to the one I usually work with) which had brain lesion data (information about whether the individual had amyloid beta aggregations or plaques) and alcohol consumption data. Amyloid beta aggregations are thought to be the cause behind Alzheimer’s disease. The protein accumulates in clumps and is believed to cause the death of neutrons, which leads to the associated memory loss. The alcohol consumption information involved types of alcohol drunk and an estimate of how much (note this is retrospective data, which is less strong than data collected in real time). The alcohol data came from relatives of the deceased, so to be fair, it’s not entirely rock-solid info. However, it’s interesting enough to show some insight into how these people lived. You’d be amazed at how much you can divulge on a person’s habits when you really think about it. One final point is that the cohort is a non-demented cohort, meaning that none of them are cognitively impaired, although some had the brain lesions. This could mean that they would have developed dementia if they had lived longer, or may alternatively suggest that these lesions can occur without dementia and there is something else required to cause Alzheimer’s disease. 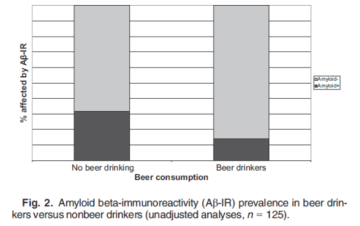 Fig 2 shows that beer drinkers had less than half the amount of amyloid beta-immunoreactivity compared with non-beer drinkers. Amyloid-beta aggregations are strongly associated with Alzheimer’s disease. I’ll focus on our most interesting results to keep it simple. We measured the amyloid beta aggregations as a dichotomous variable (present or not) and had a look whether any alcohol amounts or types were statistically associated with the brain lesions. In one of those beautiful eureka moments, the statistical program I use (SPSS, in case you’re wondering) spat out a nice significant result. 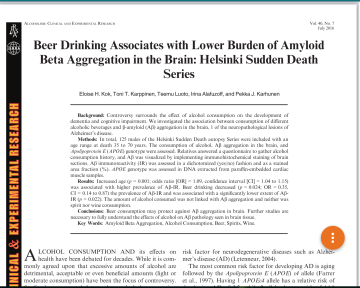 Beer drinkers were less likely to have amyloid beta aggregations in their brains than drinkers of other types of alcohol. So does that mean beer is good for you? Yes, it is possible that beer could be good for you! But before we go jumping to extravagant conclusions, let me bring you back down to the ground. This was quite a small study (125 males – which means the results cannot be assumed to apply automatically to women – sorry ladies!) and when we investigated further it seemed that age had a large part to do with the effect. But this isn’t the end of the story. I have another larger cohort with similar information (with both males and females) where I will look to see if I can find similar results. Of course it will also be nice to back up our results with a substantial theory as to how and why we found this result. 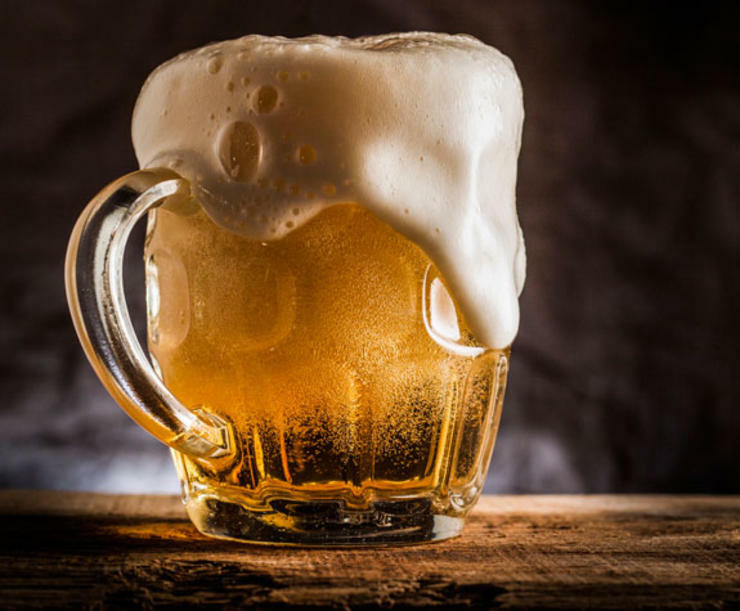 Our thinking is that beer has a number of nutrients that are involved in important mechanisms in keeping cells functioning well. So another step will be to see if we can measure certain metabolites to corroborate our story, of which I’ve made a new collaboration to tackle this topic, through the sharing of my research! So yeah, beer could potentially be good for your brain. But as I should point out all things should be enjoyed in moderation and a full healthy diet with exercise should be paramount to living a healthy long life! 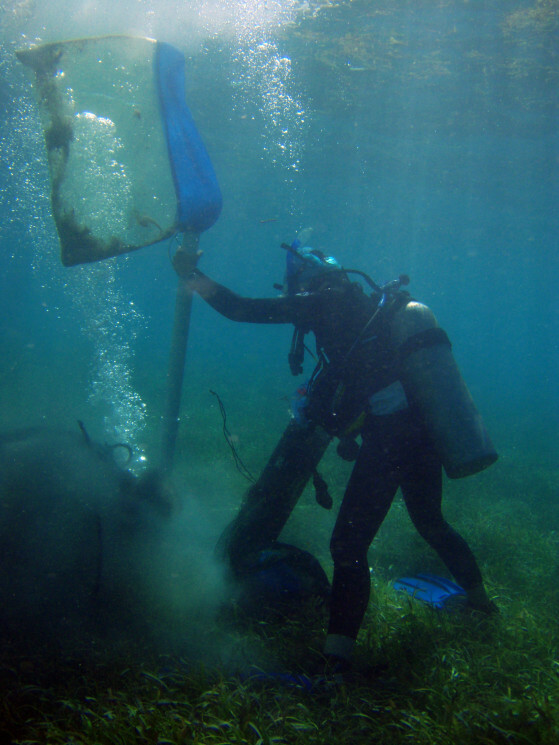 Underwater seagrass meadows are disappearing fast, Dr. Kelsey Feser investigates why with the support of the Paleontological Research Institution (PRI). The Paleontological Research Institution (PRI) in Ithaca, New York, USA is currently running a campaign to support its new dating laboratory. Before you jump to conclusions, this is not a lab taking the likes of tinder to a new scientific level, it is a lab for gauging the ages of biominerals such as seashells and bones using a technique known as amino acid racemization (AAR) geochronology (for info on how this works see PRI’s project page). The dating of biominerals and seashells has many applications in research. Fields such as paleontology, tectonics and marine conservation all benefit from accurate dating methods that can help scientists put their samples in temporal context and form a clearer understanding of what has been going on over a period of time. How did you collect the seashell samples and what can they tell us about human impacts on the spectacular marine environments of St. Croix? I collected the seashells by digging sediment cores while SCUBA diving in shallow seagrass meadows just off the coast. The cores were 40cm deep, and contained all of the sand and seashells that have accumulated on the seafloor for hundreds, or even thousands of years. By picking out the shells of thousands of clams and snails from several depths in the cores we were able to construct a record of how the abundances of these animals have changed over time. Clams and snails are very sensitive to environmental changes, particularly those imparted by human activity, so through this research we hope to determine whether the population changes we found were caused by nearby sources of pollution. The sorts of pollution sources that we think could be impacting marine clams and snails in St. Croix include runoff during heavy rains and contamination from a power plant and a large, unregulated dump. 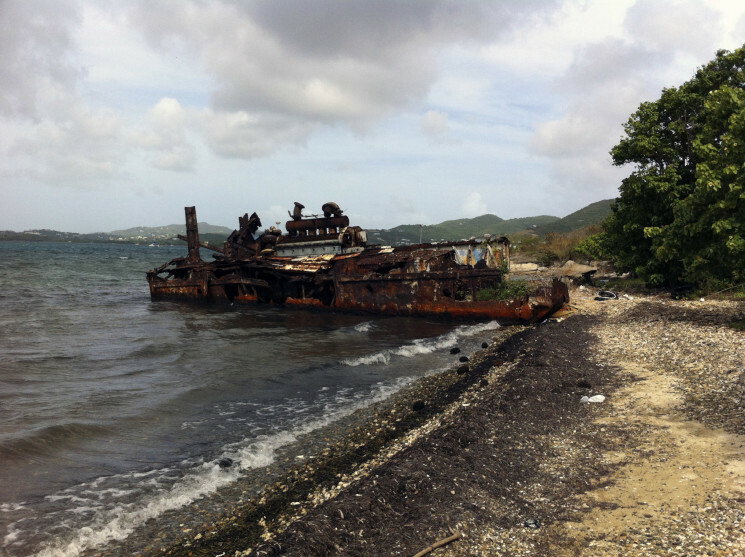 Human impacts on the coast of St. Croix are not hard to find—Dr. Feser photographed this decaying barge not far from the island’s main power plant. 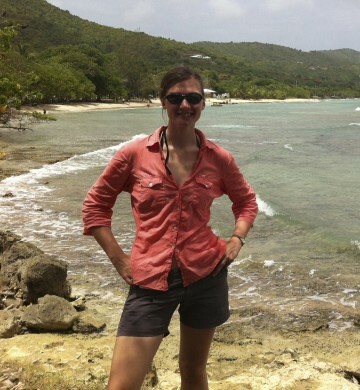 Why is AAR dating important for your research on St. Croix? What do you hope to learn from the data you are collecting at PRI? I’ve been working in St. Croix for six years, and the question that keeps popping up is “how old are these shells?” And it’s not a trivial question. I am interested in the effects of human impacts on populations of marine clams and snails through time, so it is incredibly important to know how recently these population changes took place. If they happened 5,000 years ago, humans were likely not the cause! By sampling in seagrass beds, where a thick root mat anchors the sand and prevents it from getting mixed up by waves, we are hoping to find that the deeper the shells are buried, the older they are. 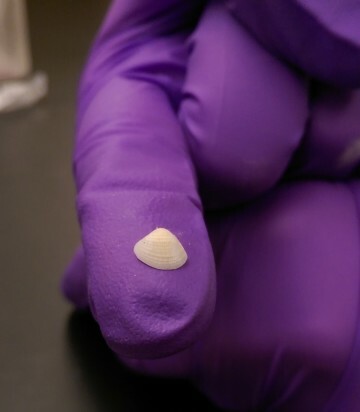 The clam shells being dated are tiny—smaller than a fingernail! This would help us better interpret the changes we see in clam and snail populations through our cores. By collecting lots of shell ages throughout a given core, we can answer this question. Finally, we want to know how long-lived seagrass beds are through time; this is especially pressing given the alarming declines in seagrass meadows around the world. By combining our knowledge of change in seagrass-indicating mollusks, and the ages represented through the core, we can determine over what timescales seagrass beds have remained stable around St. Croix and hopefully improve our understanding of what the human impacts on these ecosystems have been over time. 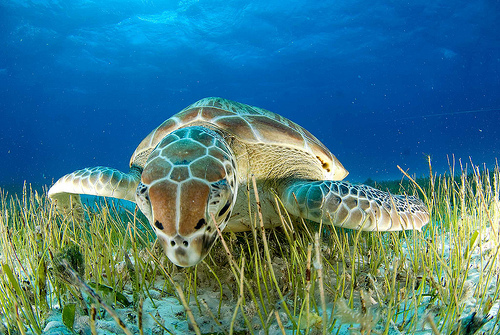 The results of this research could have important implications for the conservation of other types of marine life that rely on seagrass, such as sea turtles. What have been the benefits of running your samples at PRI? I was thrilled when I found out PRI was getting an AAR lab! By visiting the PRI lab, I have learned the AAR process first-hand and am processing my own samples. This has provided me with invaluable insight into the steps required to date a shell and has also brought down the cost of sample processing considerably. 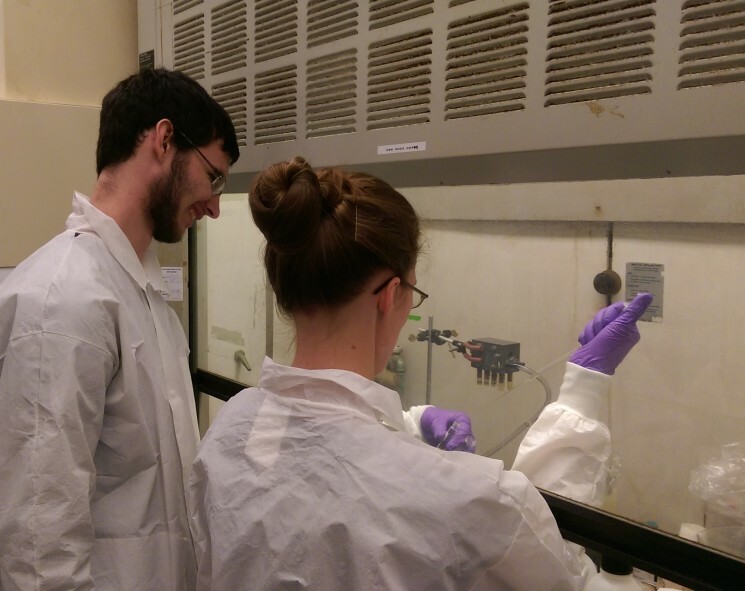 I also was able to bring along one of my undergraduate students, John Lewis, who is participating in a faculty-student summer research program with me. Neither of us could have gained this “insider’s insight” had we elected to mail our samples to a lab to have them run for us. Additionally, working with PRI researchers like Greg Dietl and Steve Durham has been valuable and hopefully will lead to new collaborations beyond my short stay here in Ithaca. A big thanks to Kelsey for answering our questions. You can learn more about her research on St. Croix in the video below. Please support our campaign to fund the AAR lab at PRI so that we can continue contributing to important projects by researchers like Dr. Feser! You can also help us by spread the word about the project! Share on Facebook or tweet about it! So, I’ve finished my crowdfunding campaign, raised enough money to survive for roughly 1-2 months, and had a whirlwind of an adventure with the press and interviews and competitions! So what’s next? First of all, let me recap. I had 66 backers, providing me with £3398. Wow. That’s amazing and totally unexpected. But it was a lot of work. I found myself on Facebook and Twitter every day trying to plug something about my campaign. It got very tiring in the end, trying to come up with new ways of saying the same thing…and I’m a native English speaker! But it did pay off in the end, and it’s given me a lot of insight into how science should be presented to the public. I’ll touch on that a bit later in more detail, but suffice to say it has led to this blog! I also became a sort of local celebrity by appearing on the local tv news. I’ve had parents, teachers, and the manager at my boys’ kindergarten point out they saw me on tv! I’ve also been amazed by the reach of my campaign. There were roughly 25 backers that I did not know – and some of them very generous – from all across the world! I was even approached for an interview by a journalism and science student from the University of Queensland! 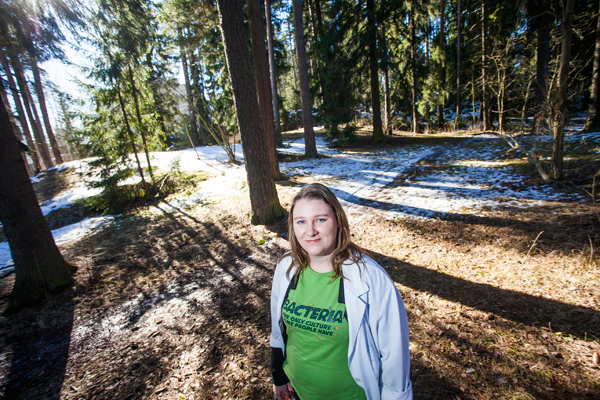 My friend nominated me, leading to me being selected as a finalist in a National (Finnish) Innovation in Research Communication competition, where I will present my crowdfunding campaign on Friday 3rd June in 6 minutes and be in the running to win €3000 (another month’s funding!!!)! So it has all been very exciting and fun! To find out people are interested in what I actually do, instead of the usual party line of “I’m a biochemist and I study Alzheimer’s disease.” I feel comfortable now going into details, encouraged by the enthusiasm and questions from people without a science background (and to be fair, also those WITH a science background, but that’s not new to me). Whilst all this was going on, I’ve managed to get a manuscript published (hear more about that in another blog as it hasn’t officially been published yet), and submit another. I feel like I actually have a career! My boss has also secured some funding, so he can fund me a few months after the summer, which has really made me feel like my research is worth doing – on a broader scale than just me thinking it’s important. So to summarise, I’ve had to put a lot of hard work into marketing my research. It was difficult, and I had to change my mindset and think of what the general public would be interested in hearing about (as opposed to the grant funding agencies), as well as spam the hell out of all my friends/colleagues and family (sorry everyone!!!) and use a lot of time on social media. But, it was worth it. I had a blast, and it has encouraged me to take my research to the public on a more regular occurrence. I’ve started this blog, and if things look a bit dire in the future, perhaps I’d even approach a crowdfunding campaign again. Who knows? At least one thing I’ve learned…it’s not a bad thing for a scientist to engage the public! Thank you and until next time! You can view Eloise’s crowdfunding campaign page here. Project Update: Can The “Spirit Molecule” DMT Help Protect Brain Cells? What do you associate with elves? Christmas? The Lord Of The Rings? DMT? For the vast majority of people, the latter is doubtful, and you’re probably left a little confused right now. But for those who have experienced the psychedelic effects of the hallucinogenic chemical DMT, the mention of elves may well have just flooded your mind with memories of that drug trip. DMT, or N,N-Dimethyltryptamine, is a powerfully psychoactive compound that can induce profound experiences, such as the feeling of transcendence and intense visuals. These hallucinations commonly feature humanoid beings or entities sometimes described as elves. But there’s much more to DMT than otherworldly creatures; some scientists believe it may have a place in modern medicine, and the brains behind a successful crowdfunding campaign launched on Walacea last year has made it his mission to explore this idea further. Six months on from the campaign’s closure, we caught up with this quirky scientist for an exciting update on how the project has progressed so far, and plans for the future. Those who generously backed the project may be familiar with the science, but we’ll start off with a bit of background for those who aren’t. 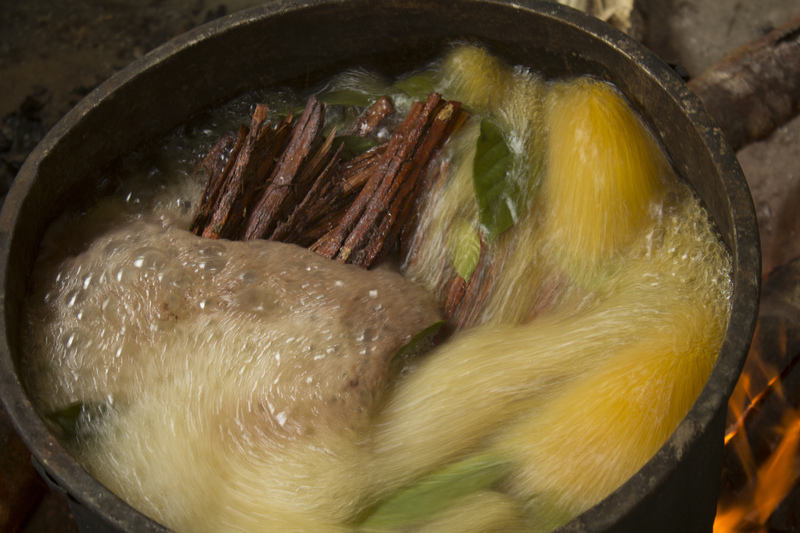 DMT is produced by many different plant species, some of which are used to make the hallucinogenic drink ayahuasca, used for centuries by Amazonian tribes in shamanic ceremonies. It’s also found naturally in very tiny amounts in humans, known as “endogenous DMT,” and fairly recently it was discovered that the human brain has multiple active transport mechanisms that allow it to cross our protective blood-brain barrier and cellular membranes. Together, these suggest that DMT likely has some role or purpose in the body, other than being a hallucinogen. Interestingly, DMT also acts on a cell receptor called sigma-1 which studies have indicated has a protective and restorative function in neurodegenerative diseases and brain ischemia, or the restriction of blood flow to the brain, suggesting it could also play a role in stroke. 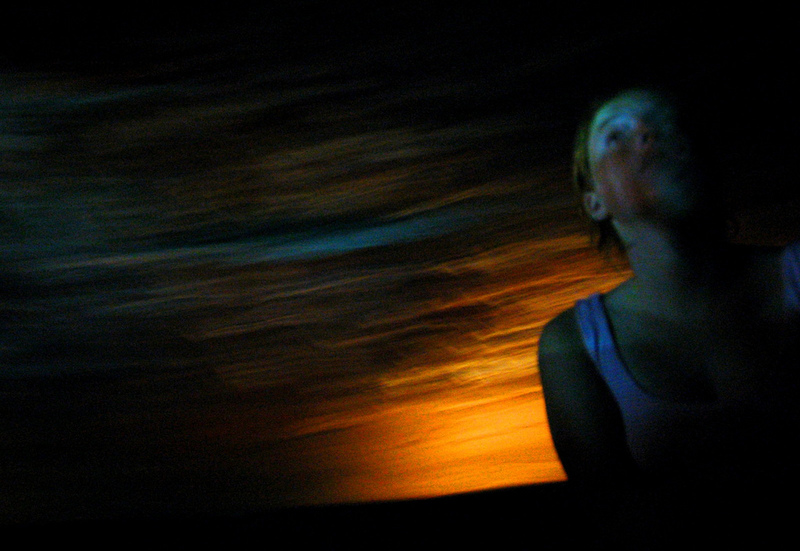 This, combined with the fact that near-death experiences have been likened to DMT trips, forms the foundations of Dr Ede Frecska and colleague Attila Szabó’s research, who believes that DMT could help protect brain cells from damage caused by a lack of oxygen, or hypoxia, such as during a heart attack, coma, or clinical death. After successfully smashing his crowdfunding goal of £2,000 last November, raising almost £3,600, Ede Frecska and Attila Szabó have now completed the first phase of their studies, and the results were very promising. More specifically, Frecska explained that his team exposed human stem cells that had been coaxed into becoming neurons to low levels of oxygen and added varying concentrations of DMT to different dishes. As expected, being starved of oxygen caused the cells to become stressed and die, and adding very low concentrations of DMT didn’t seem to mitigate this. However, higher concentrations of DMT caused three times as many neurons to survive. They also repeated this procedure with a different type of brain cell, called glia, and found similar results. “The next step is to start using animals,” said Frecska, “so I wish to publish this second DMT paper soon. We have already published work showing that DMT has an anti-inflammatory effect.” That’s also a potentially important find, since chronic inflammation has been linked to a myriad of diseases of civilisation, from Alzheimer’s to heart disease. If results in such animal models are similarly encouraging, indicating some neuroprotective role of DMT during hypoxia, then Frecska hopes to pursue human trials, possibly investigating its use in individuals whose brains have sustained injury or a lack of blood, and thus oxygen flow. But to progress his work, Frecska needs further funding, which is hard to come by for most scientists, let alone those working on Schedule 1 drugs like DMT. “Psychedelics are stigmatised,” said Frecska. “You don’t have an endogenous opioid system just so you can have a nice time in an opium cave! And we don’t have endogenous hallucinogens just to make us go crazy. Psychedelics are proving themselves not only as promising therapeutics, particularly with regards to mental health, but also as a potential window for investigating fascinating subjects like consciousness – check out the groundbreaking LSD research we also helped crowdfund. It’s time to end the stigma so that more studies like these can be conducted, and so research isn’t hindered by outdated ideas that are rooted in fear rather than science. Thank you for helping towards that goal, and for bringing this study to life! Evolutionary education: An approach set in stone? The Virtual Natural History Museum, a project which is being led by a team of palaeontology experts at the University of Bristol, will provide a unique resource to teachers – offering digital access to specimens rarely seen outside of academia. Its creation follows a request from the UK’s Earth Sciences Teachers’ Association, which asked professional palaeontologists for help in collecting multimedia resources to help illustrate their lessons. The request was picked up by Palaeocast, a palaeontology podcast operating out of the University of Bristol. They’ve attracted funding from The Palaeontological Association and the Geologists’ Association and are crowdfunding to cover the remaining costs. This website will primarily rely on the online research catalogues that museums produce for academics, bringing them together in an easily-accessible way. Dave explained: “Many museums have digitised large parts of their collections and made them available to the scientific community. Unfortunately, they don’t publicise these catalogues to the public, nor are they presented with any sort of engaging interface; they’re just a gallery of specimen numbers and pictures. The user-interface of this virtual museum is set to appear and function exactly like a computer game; allowing users to explore the collections using an avatar, just as you would do in real life. While produced for a specific educational purpose, the Virtual Natural History Museum will allow for whole collections to be publically displayed for the first time. The fossil collections of the National Geological Repository are the second-largest in the UK, but they have no public exhibition. 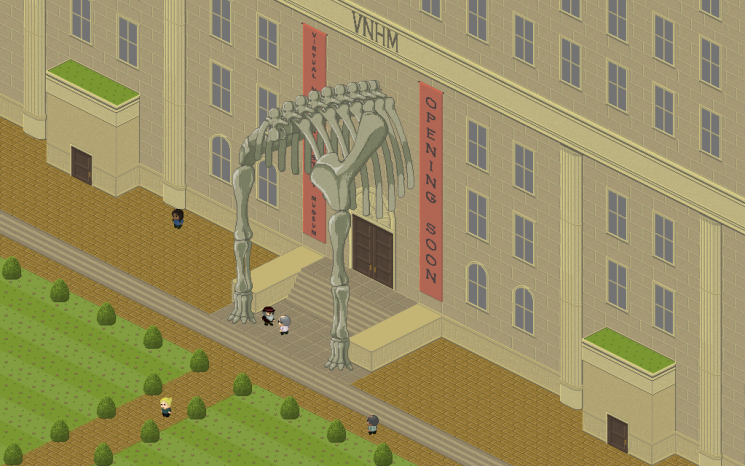 Even large museums, such as the Natural History Museum in London, only display a fraction of their specimens. The Virtual Natural History Museum will be able to provide a public front for those museums without displays and offers the option to exhibit fragile specimens without them needing to leave the collection stores. The project has already been supported by numerous museums as well as educational and academic associations, including the Earth Science Teachers’ Association and the National Geological Repository. Please support generously on the Walacea crowdfunding page.